The PIK and PUK Series multi-level terminal blocks are specialty terminals to fit a variety of needs. 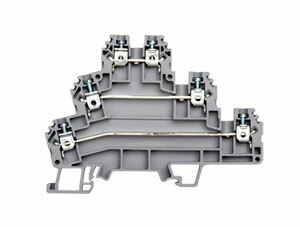 The PIK-4N terminal blocks allows for 2 level feed through connections while the PIK-4NK has an internal connecting bridge for common feeds that allow for one-in and three-out connections. The PUK Series sensor terminal blocks reduce installation time by terminating 3 and 4 wire devices like RTD's, photoelectric and proximity sensors in a single terminal block. The PUK-3 is a three level feed through terminal, while the PUK-2T and PUK-3T are for 3- or 4-wire sensors and come with a ground connection.